Fetish Furniture is proud to offer the best choice. Our website is home to some of the most desirable and prestigious products around including cages, suspension items and accessories. For true quality and value, look no further. Each item is handmade by combining modern techniques with traditional skill and checked for quality assurance meaning your product will arrive to you exactly as you would expect from any Company. The only limitation is your imagination. 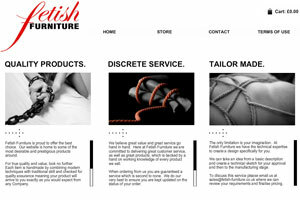 At Fetish Furniture we have the technical expertise to create a design specifically for you. We can take an idea from a basic description and create a technical sketch for your approval and then to the manufacturing stage.